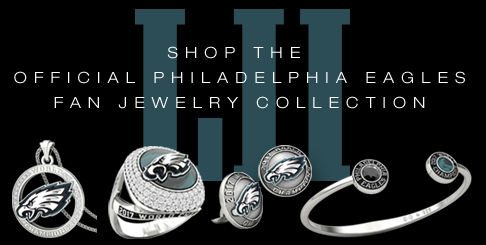 The Official Fan Jewelry Collection celebrates the Philadelphia Eagles Super Bowl LII Championship with this exclusive line of finely crafted jewelry and commemorative keepsakes. The Philadelphia Eagles Super Bowl LII Championship Ring commemorates the organization’s historic 2017 season which culminated in the team’s epic victory over the New England Patriots and their first Super Bowl Championship title. The ring is made of 10-karat white gold and features 219 diamonds and 17 genuine green sapphires with a total weight of 9.15 carats. The rare rough green sapphires were secured to match the official team color. 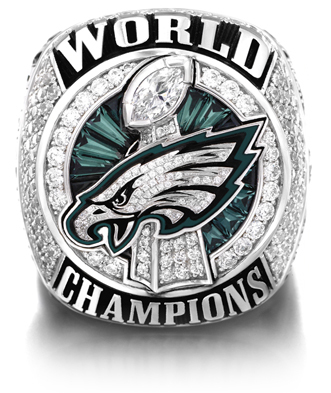 The ring top features the Eagle head logo, set atop the Vince Lombardi Trophy and custom-cut, genuine green baguette sapphires surrounded by intricate, pavé-set diamonds. Fifty-two pavé-set diamonds are set within the Eagle head, signifying Super Bowl LII. The bottom portion of the base of the trophy features 13 pavé-set diamonds representing the 13 regular season victories that tied the franchise record. 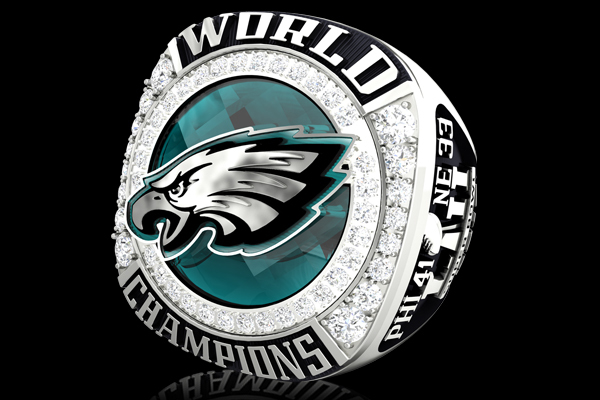 The top of the trophy is adorned with three diamonds, representing not only the number of times the Eagles were deemed underdogs, but also the number of post-season victories it took to be crowned World Champions. A large marquise-cut diamond is featured at the top of the Vince Lombardi Trophy to represent the first Super Bowl Championship in franchise history. To round out the ring top, the words “WORLD CHAMPIONS” adorn the top and bottom edges. The bezel of the ring features a waterfall of 127 diamonds, paying tribute to one of the most memorable moments in franchise history – “The Philly Special” – the trick play that resulted in a touchdown on fourth-and-goal from the 1-yard line in Super Bowl LII. The 127 diamonds represent the combined jersey numbers of three key players involved in the play – Corey Clement (30), Trey Burton (88) and Nick Foles (9). 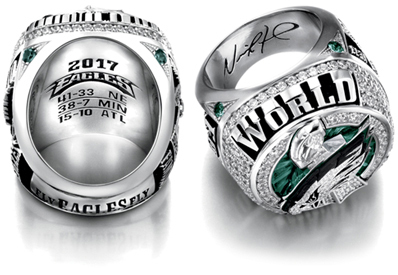 Four round, genuine green sapphires adorn the corners of the base of the ring and symbolize the team’s four NFL Championships – three World Championships (1948, 1949, 1960) and one Super Bowl Championship (2017). The left side of the ring features the player’s name set above an end zone view silhouette of Lincoln Financial Field, the home of the Philadelphia Eagles. The inclusion of the stadium is a symbolic tribute to the passionate and dedicated fan base that has supported the team since its formation in 1933. 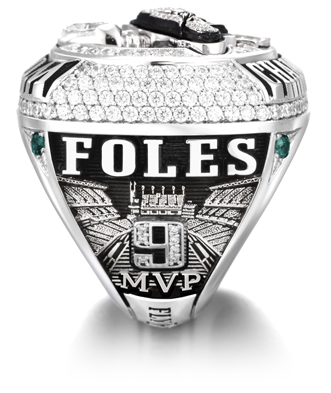 The player’s number is studded with pavé-set diamonds and set in the middle of the football field. 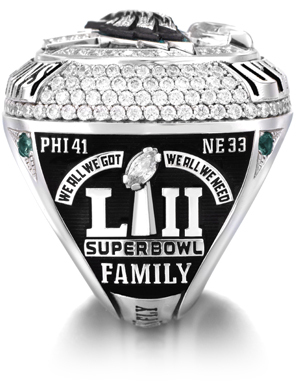 The right side of the ring features the score from Super Bowl LII (PHI 41 – NE 33) and one of the team’s messages of unity throughout the season, “WE ALL WE GOT, WE ALL WE NEED” is set above the Super Bowl LII logo. The word “FAMILY” sits below the logo and serves as a reminder of the team’s commitment and dedication to each other. In honor of Eagles fans across the region, country, and world, the words from the team’s fight song, “FLY EAGLES FLY” are written on the bottom of the outer band. The top of the inside arbor of the ring is inscribed with the scores from the team’s three postseason victories and an image of an underdog mask, an acknowledgement of how the Eagles embraced and overcame their underdog role to galvanize the team, the fans and the entire city of Philadelphia. The bottom of the inside arbor is inscribed with each player’s signature – the first-time championship rings have ever featured engraved signatures.